* Total number of reviews and star-ratings are based on data collected during the time period Albert Air has been using the ReviewBuzz system and may not directly match the data found on each public review site. 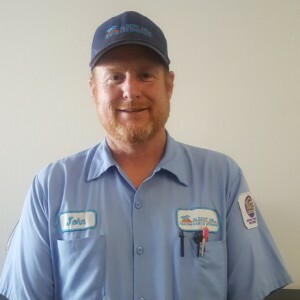 Albert Air is a courteous, friendly, local business with expert skills in locating problems, and planning reasonable solutions. All work was done well, and within the estimated time for the project. They were clean and efficient. They approached my duct repair with the kind of ease and competence you can expect from an experienced, responsible team of contractors. 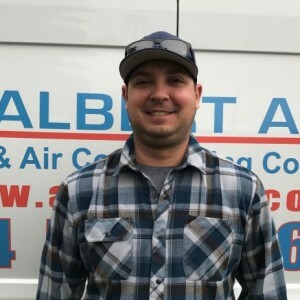 We recently had our heating, a/c and under-floor ducting replaced by Albert Air, Inc., of Fullerton. Our old system had not worked well for many years and we were very concerned that we would spend a lot of money and end up having a brand new system that still didn’t work well for our home. Nick Albert came out and inspected our home’s heating & a/c and explained all the possible options. John evaluated the under floor ducting and air flow possibilities. They were both great in explaining to us exactly what could be done to improve the heating and cooling of our home. Once we decided to proceed, their crew: Aurelio, Martin and Miguel arrived as scheduled with John and Nick to start on the tear out and removal of all the old equipment and begin the installation. These men were neat, organized and thorough and during the 3-4 days of work were always polite, friendly, careful and willing to answer our many questions regarding just what they were doing, how things worked, etc. They also identified several deficiencies in our old system and corrected these issues in order to ensure a properly working system. They took great care of our home and left a clean work area each day. Nick came by several times a day to check progress and update us and when the job was done showed us how to operate the new system. As soon as the new system was turned on we knew we had made the right choice. The end result is a system that is blowing more heated air in places in our house that have not been serviced in years! And it’s doing it quickly and quietly. What a joy! We’re not ready to try the air conditioning yet but we are confident that it will be perfect, too. Thank you, Albert Air! Most professional and really rapid installation. Finished below cost and ahead of schedule. Would recommend them. We have used their service for more than 40 years. First with The father and now with the son. They keep up the good work. Albert Air does its job as expected, professionally, with great communication, in a friendly manner. Thanks to that, I was able to go about my day as normal as possible without any added stress. I have been very satisfied with their service in the past, with a partial system replacement and about 4 service and repair calls, thanks John. This time I had them do a full system replacement, using a split system with ducting. Again, I was pleased with what Nick had communicated with me, and Aurelio, and Martin had installed, that had gone so well. Thanks Guys, I am very happy with the service, and would suggest Albert Air to anyone! Professional from the start. On time, polite, quiet as much as possible, cleaned up afterwards. Nick came by a couple times everyday to make sure progress was on schedule and installation being done correctly. Work was completed on time. As is my usual practice as a facilities manager for years, I did not take the lowest bid, nor the highest and base the rest of my decision on the professionalism of the contractor. My process didn't fail me again. Outstanding service. The workers were prompt and did a great job of installing a new heater, air conditioner and ducts. I would highly recommend them. Martin, Aurelio, and Nick were professional, thorough, and terrific to work with. They showed up on time, were kind and pleasant to have on the job, cleaned up at the end of each day's work, and found solutions to issues in creative ways that resulted in a better finished product than we had requested. We're thoroughly satisfied with Albert Air's work and service! 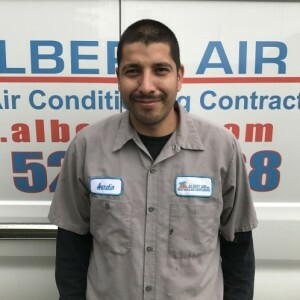 Our experience with Albert Air was top-notch from start to finish--including the presentation, the proposal, the work of replacing the furnace/air conditioning system, and the clean-up. Nick and his team (Aurelio and Martin) were professional, knowledgeable, responsive, and conscientious. It was refreshing dealing with a contractor who operates with integrity and pride in their work! First, thanks for making it easier for "this old lady" to do this! It is greatly appreciated. Second -- I just want to say "ditto" for ALL the good things that have been said about Nick and Aurelio and Martin and all the crew -- Jeff included!! Everything was explained to me so that I could understand what was happening; everything was taken care of when I was told it would be; inspections were handled very professionally; warranties taken care of (again greatly appreciated) so that I didn't have to do that either! I have nothing but good things to say about Albert Air -- all parties who worked here were polite, congenial, professional. Nothing but raves from me. I'll be doing any follow-up work (and any recommendations to others) with Nick and company. Thanks much to you all. Very happy with the way staff was able to get John out during there busy schedule, John was able to have my air up and running with in an hour. The prices are great, I will be using them for all our HAVC problems. I was very pleased. Thanks again Albert Air. Our air conditioning went out during the recent heat wave and my pregnant wife and I were miserable. I called Albert Air after getting some ridiculous high estimates from other companies. Nick, from Albert Air, gave me an honest assessment of our heating and cooling system and a reasonable price. We were immeditaly put on the schedule. The team that came over were professional and answered the many questions I had for them. My wife and I are very happy with our new air conditioning system and the service we received from Albert Air. I couldn't be happier, the service I received from Albert Air Inc. was top notch. From my very first contact with the company to the very end when my new A/C and furnace were up and running. A huge thank you to Nick for going the extra mile to get me on the schedule as soon as he possible could, it was greatly appreciated. I would highly recommend Albert Air Inc. to all my family and friends! Thank you Albert Air Inc. for the great work!!! Albert Air does excellent work at a reasonable price. Had my old abestos covered ducts replaced and can immediately feel the difference the house cools down faster. Nick pays attention and met my concerns. Aurelio and Martin do their work with care and are very polite. Both teams the abestos removers and Nick's crew were efficient and professional what more could you ask for? The Team at Albert Air was fantastic. Starting with Nick in configuring what I wanted and needed. Then Aurelio and Martin stepped in and did a fantastic job installing the hardware. I am 100% satisfied. The installation was clean and neat. The equipment worked Superbly. I thank Nick for listening to what I wanted and adding what I needed with no big up sell pitch. Burr its cold in the house....and the equipment is real quiet. Can barely hear it run. Albert Air was recommended by a friend and they did not disappoint. Not only are they professional and responsive, but they exceeded rather high expectations with the quality of their work. They were also the most affordable option of the bids I received. I would recommend them to others without any hesitation. Consistently good service from this well run company. 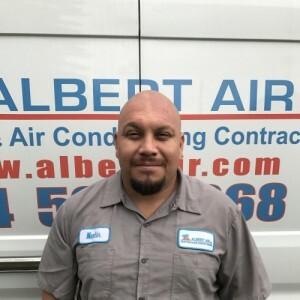 I recently purchased a multi-room mini-split HVAC system from Albert Air and, from purchase through installation, the guys I worked with--Nick, Aurelio, and Martin--exhibited nothing but good, solid, professional work throughout. Nick was very knowledgeable about every aspect of the product he was selling and always willing and able to answer my questions openly and honestly, inspiring trust--well-earned--in the buying and installation process. He was willing to come out to the house more than several times to help me make decisions about the potential placement of the condenser and various air handlers that were to be installed. The two techs--Aurelio and Martin--in charge of the actual installation, were friendly, on time, careful always to use tarps on the floors and carpets for cleanliness, and showed great care working around my furniture and other household items. Throughout the whole process, they also cleaned up every day after completing their work and were well-trained, experienced, knowledgeable, and always open to questions I might have concerning the equipment they were installing. All in all, a job well done by everyone concerned. Customer service is always a top priority at Albert Air. Our BBB Membership A+ rating is like a badge of honor as we continuously strive to provide the best experience for our clients.